Screen Time and Young Children – Are today’s children ready for school? For the past two months, we asked professionals and parents questions about screen time and young children in order to determine if today’s children are physically ready for school. Children’s readiness for school, according to the National Education Goals Panel, consists of the following elements: physical health and motor development, social and emotional development, approaches to learning, language development, and cognition and general knowledge. The results of the survey indicate that an overwhelming majority of professionals and parents agree that screen time is negatively affecting a child’s ability to be ready for school. When you take a look at the current stats on screen time and young children, it is alarming. Today, about 29% of babies (YES babies) under the age of 1 are watching TV and videos for an average of about 90 minutes. Even 23% of babies ( YES babies) have televisions in their bedrooms. As babies transition between their first and second birthdays, now 64% of babies and toddlers are watching TV and videos slightly over 2 hours per day. In this age range of 1-2 years old, 36% have a television in their bedroom. 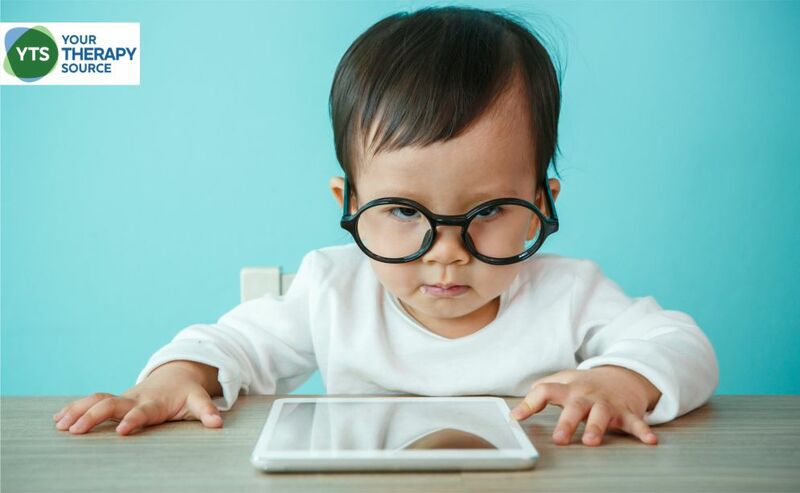 Time with screens increases rapidly in the early years. When children hit the preschool years, the trend continues. Research indicates that children between the ages of 2 and 5 years old, interact with screens anywhere from 2.2 hours per day to 7 hours per day. When you consider screen time and young children on a daily basis, you quickly realize that children may be missing out on important practice time for key developmental skills. Question #2 was on screen time and young children. Eight statements were provided regarding screen time and the affects on young children with options to answer: Strongly Agree, Agree, No Opinion, Disagree and Strongly Disagree. 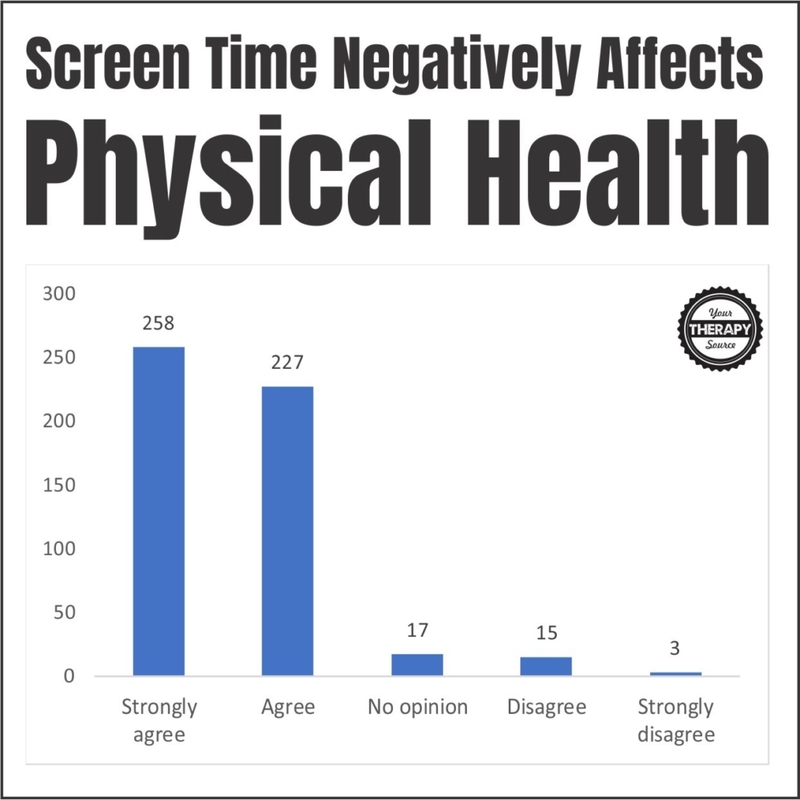 93% strongly agreed or agreed that screen time negatively affects physical health. 3% disagreed or stronlgly disagreed that screen time negatively affects physical health. 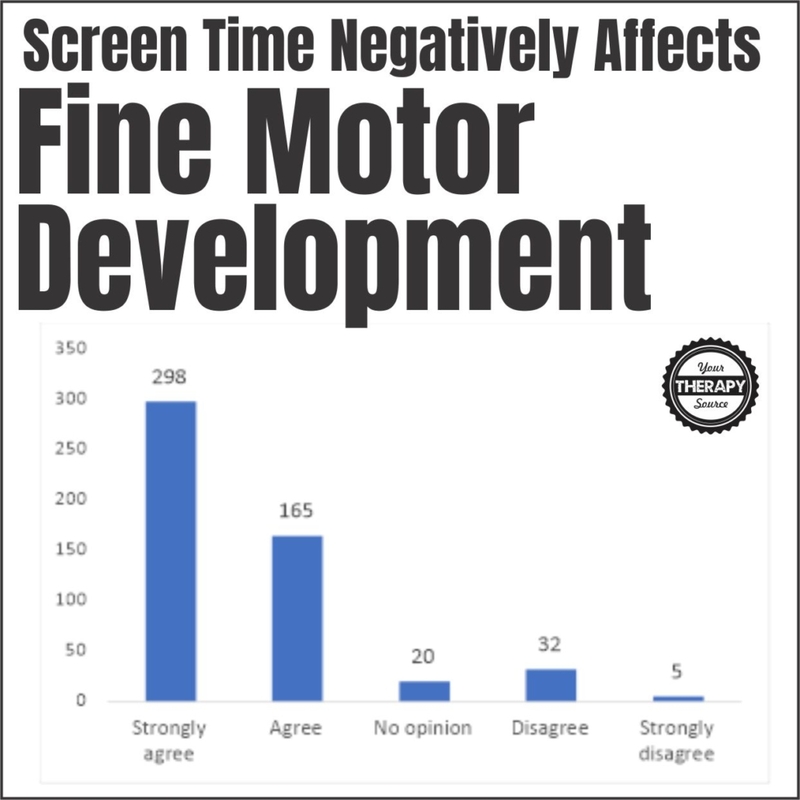 89% strongly agreed or agreed that screen time negatively affects fine motor development. 7% disagreed or strongly disagreed that screen time negatively affects fine motor development. 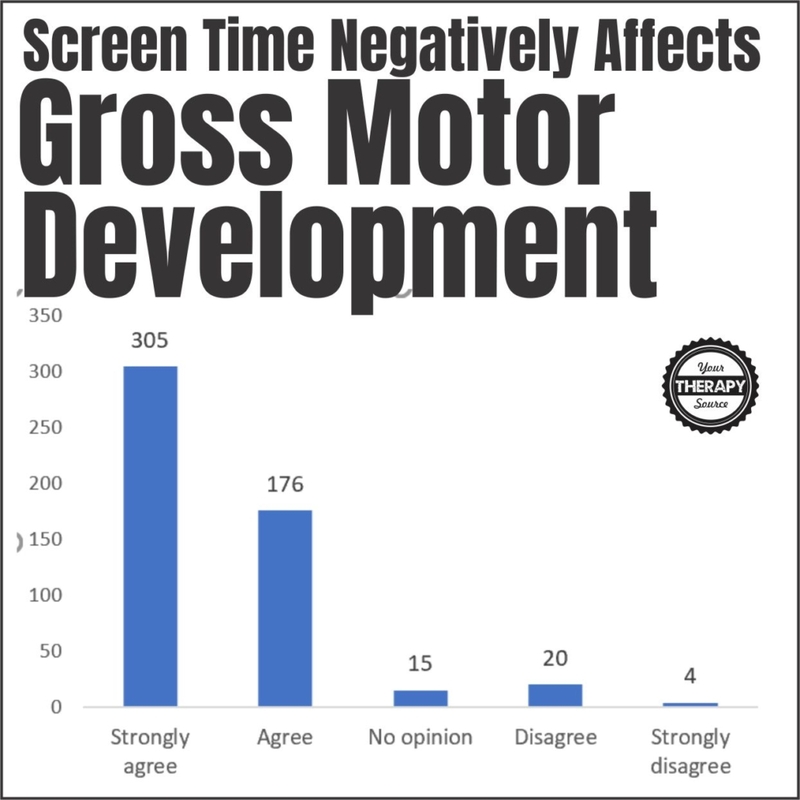 93% strongly agreed or agreed that screen time negatively affects gross motor development. 5% disagreed or strongly disagreed that screen time negatively affects gross motor development. 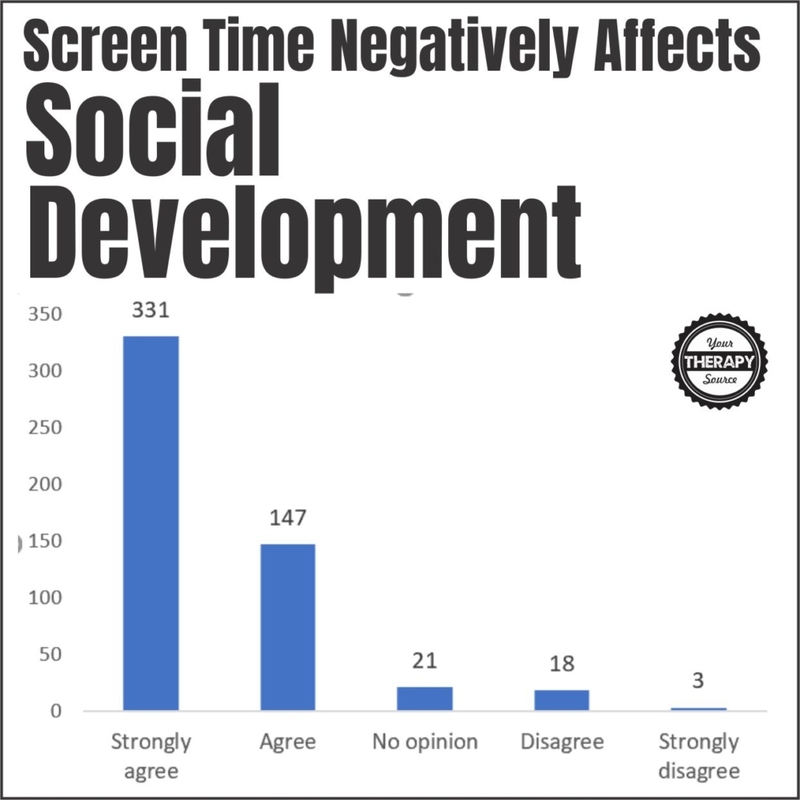 92% strongly agree or agree that screen time negatively affects social development. 4% disagree or strongly disagree that screen time negatively affects social development. 76% strongly agreed or agreed that screen time negatively affects a child’s approach to learning. 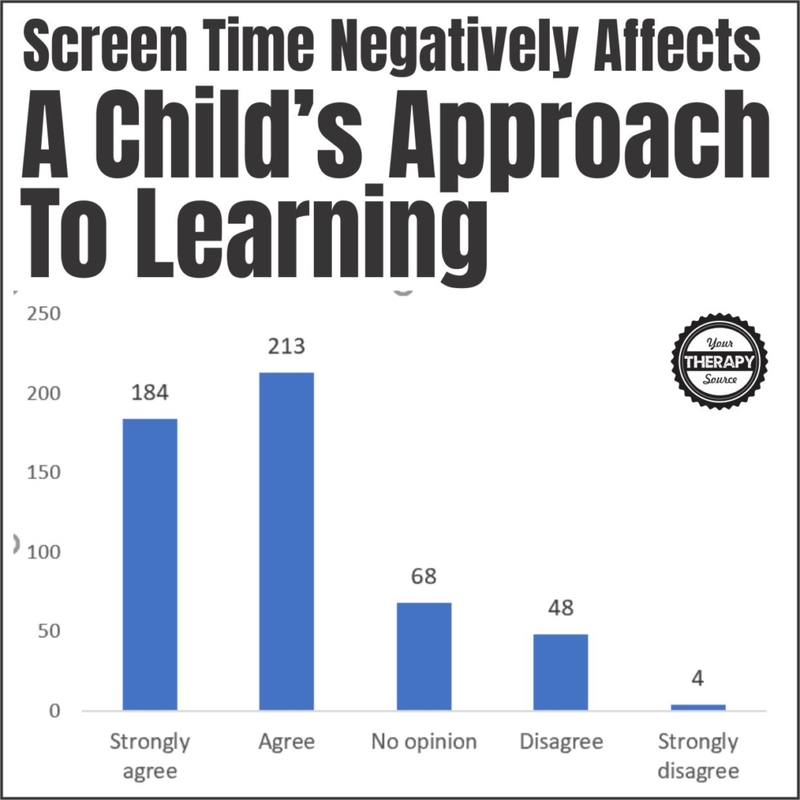 10% disagreed or strongly disagreed that screen time negatively affects a child’s approach to learning. 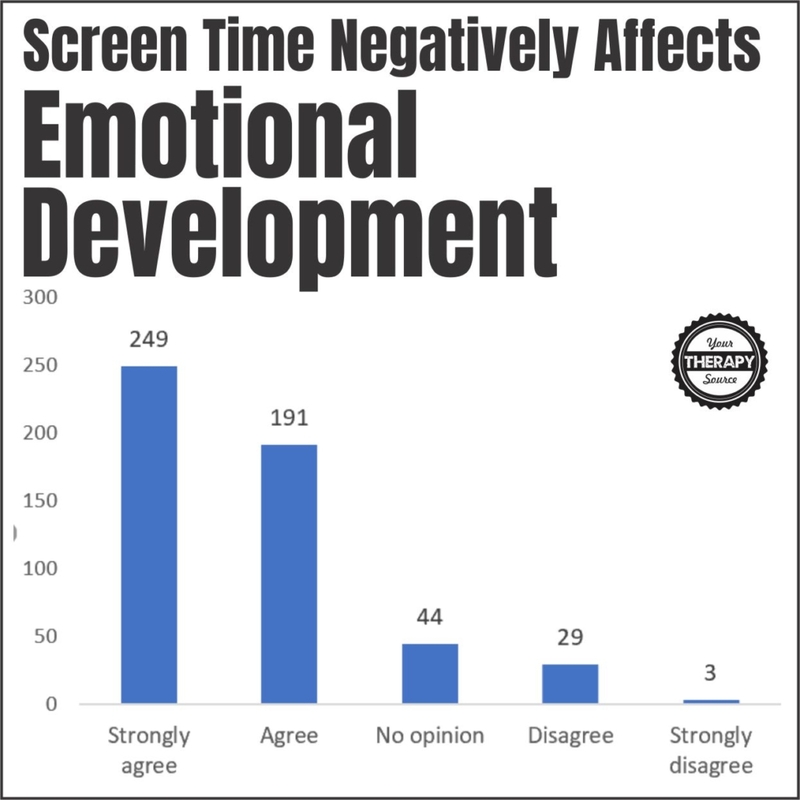 85% strongly agreed or agreed that screen time negatively affects emotional development. 6% disagreed or strongly disagreed that screen time negatively affects emotional development. 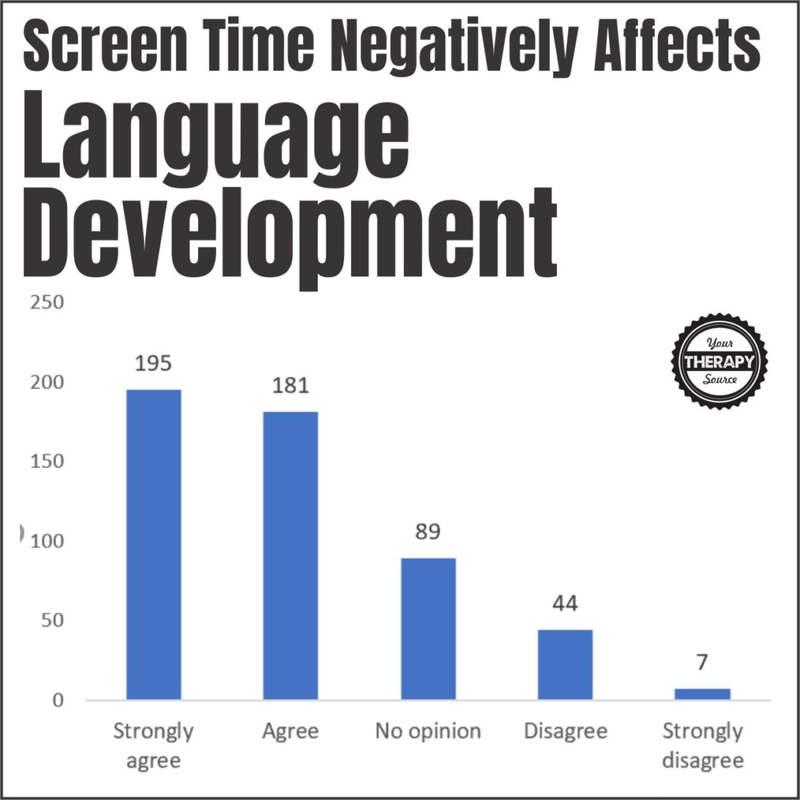 73% strongly agreed or agreed that screen time negatively effects language development. 6% disagreed or strongly disagreed that screen time negatively effects language development. 65% strongly agreed or agreed that screen time negatively affects cognition and general knowledge. 18% disagreed or strongly disagreed that screen time negatively affects cognition and general knowledge. So if the overwhelming majority of professionals and parents agree that screen time is negatively affecting a child’s ability to be ready for school, does the research back up their opinions? The answer is YES. Excessive screen time can be detrimental to many aspects of childhood development. Increased screen time is a risk factor for childhood obesity, increased BMI and increased food intake in both low-risk and high-risk populations. Take a look at this fact: for each hour of television viewing per day, children consume an additional 167 calories! Makes sense right? Adults tend to snack when watching tv too! Even if you think playing active video games will combat the risk, think again. Children who own active video games like the Wii do not show an increase in physical activity. Screen time can even disrupt sleep patterns in little ones. In children under 3 years old, screen time is linked to irregular sleep patterns. Did you know that children who spend less time watching television in the early years, have a greater chance of doing better in school, are more physically active, and are better able to engage in schoolwork in later elementary school? Research indicates that more than two hours of recreational screen time in children was associated with poorer cognitive development. A study on language development indicated that each additional 30 minutes of hand-held screen time was linked to a 49 percent increased risk in expressive speech delay. When young children spend too much time on screens that limit their time to participate in regular play routines. Research indicates that the more time preschool children spend with screens, the less time they spend engaged in creative play, constructive problem solving, and creativity. Also, when they are interacting with screens they are NOT interacting with other people like their peers or parents which is crucial for learning social and emotional skills. For toddlers, higher levels of early exposure to screen time has been associated with problems in later childhood, including lower math and school achievement, reduced physical activity, and victimization by classmates. Gross motor skill development may also be influenced by screen time. One study indicated an adverse influence on screen time at 4 and 5 years old on motor proficiency at 7 years old. What can you do to help reduce the negative affects of screen time on young children? For children younger than 18 months, avoid the use of screen media other than video-chatting. Parents of children 18 to 24 months of age who want to introduce digital media should choose high-quality programming, and watch it with their children to help them understand what they’re seeing. Parents and professionals need to set a good example as well. Children model what they see. If you want children to reduce their screen time, reduce your own screen time as well. Be sure to provide children with ample opportunities for open-ended, active play to help children to develop skills necessary for when they start school. Play – Move – Develop: 100 reproducible games and activity ideas to encourage motor skill development and learning in children. A great resource for fun, home exercise program activities. Want to learn even more on how to help young children develop the skills necessary for school? The Get Fit for School webinar entitled “Popcorn and Animals Make My Muscles Strong!” can help educate parents, teachers, and therapists on how we can effectively prepare children physically for success at school! Cadoret, G., Bigras, N., Lemay, L., Lehrer, J., & Lemire, J. (2018). Relationship between screen-time and motor proficiency in children: a longitudinal study. Early Child Development and Care, 188(2), 231-239. School Readiness – Are Children Physically Ready? Valentine Game Printable – Free!